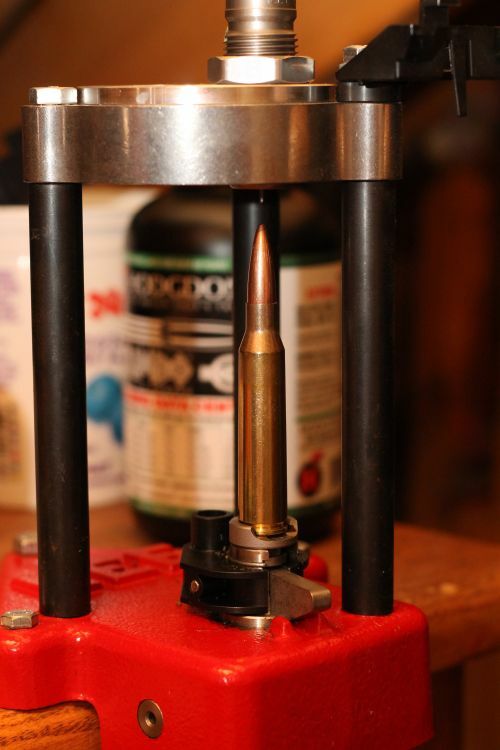 Reloading for the 338 Lapua is much like reloading for any other cartridge, but certain exceptions are out there. As with any reloading information you find on the internet, you assume your own risk. Use your head and a few reloading manuals. Most of the bullets in .338 are better suited for the speeds of the 338 Winchester Magnum, 338-06, or 338 Federal and may fragment if pushed by the 338 Lapua Magnum and impact game at close range. Just for comparison’s sake, the 338 Federal will send a 215 grn bullet out at 2500 fps, the 338-06 will do 2600, and the 338 Win Mag will do 2800fps while the Lapua will send it down field at 3200fps. That’s a pretty big difference, and given the relative popularity, you’re going to find more bullets designed for those other rounds than you will for 338 Lapua speeds. 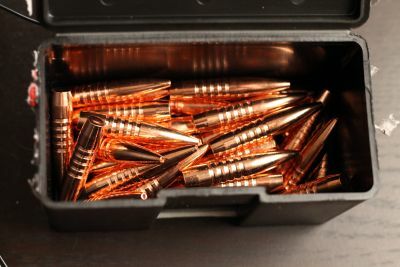 Impacting at above 3000 fps can be a bit tricky for a standard bullet, so you’ll need to use a bonded, copper, or other premium constructed bullet for it to stay together if you go with one of the lighter bullets. You also need to be careful you’re not using a match bullet for hunting. Some will expand, but performance on game is not as controlled as it will be with a purpose built hunting bullet. Here are some of the bullet options out there for the 338 Lapua. I’ve only lised bullets above 220 grains as the lighter ones make better short range bullets and this cartridge is really built for much longer distances. I’ve also skipped some of the ones with really poor B.C. for the same reason. Note: if your barrel twist is slower than 1:10, consider one of the 250 grain bullets instead of the longer 300’s because you might run into stability problems. 225 grain bullets in MRX, TSX, or TTSX, 250 grain TSX and TTSX, 285 grain TSX and 285 grain TAC-X BT. I found the “M/LE” designation on the TAC-X bullets a bit odd, as I really don’t see why law enforcement would ever use a 338 Lapua over a 308 for the distances they need, but whatever. In any case, they’re one of the few heavier bullets in 338 still suitable for hunting. Nosler’s 250 grain AccuBond is the only bullet that I’d run with for hunting, but they also have a 250 grain partition if that’s your speed. They have a new 300 grain AB that I’d love to try, but it’s a bit hard to get where I shop right now. Sierra’s 250 grain GameKing would be a great traditional option. They also have a 215 grain bullet, but I wouldn’t think it’d be ideal given the speeds the 338 Lapua can produce. A lot of long range hunters like to use their 300 grain SMK for hunting, but Sierra does not recommend this bullet for hunting. Some people have complained about poor expansion when they impact game at extreme ranges and low velocity, but for the number of people who are using the 300 SMK for hunting, it’s a small minority. The Lapua in a 300 grain bullet produces a ton of power so any bullet that hits bone, fragments, or expands is going to do lots of damage. Hornady has a traditional 250 grain BTHP . They also have a 285 grain BTHP but it’s designed for match, not hunting. Their 225 grain interbond might survive impact well given the bonded jacket. Their 225 grain SST might not, but your mileage may vary. Speer’s Grand Slam comes in a 250 grain package that’d do the job. Berger has a 250 and a 300 grain “Match Hybrid OTM Tactical” (how’s that for a mouthful?) that look to be some of the best really long range bullets for the 338 Lapua. Like the 300 SMK from Sierra, it’s not strictly designed for hunting, but it will likely expand and do damage in most situations. Lots of hunters on LongRangeHunting.com have had great success with both the 250 and the 300 grain bullets. Lapua has a 250 and 300 grain Scenar bullet, though there have been comments that the jacket is too strong and that the bullets frequently fail to expand or do much of anything except banana or pinhole through much like an FMJ. Below is a table showing 338 Lapua bullets and comparing stated G1 Ballistic Coefficients, weights, and styles. One other issue you may run across is disparity in what the max length of cases should be. From reading on a few forums as well as experience with my Savage 111 Long Range Hunter in 338 Lapua, it seems that the Savage chambers are cut a bit tight. There are 2 official case trim lengths given out there as well as an unofficial best practice length. LEE recommends a max case length of 2.726″ while Lyman and Nosler say 2.724″. You may want to trim much sooner as some users of the Savage 338 Lapua’s have experienced jamming at beyond 2.720″. I personally experienced high pressure signs in my Savage whenever the trim length got above 2.72″. On the plus side, the tighter chambers on the Savage will mean longer brass life and potentially better accuracy. Personally, I trim to 2.714” using a Lee hand trimmer. The most commonly used powders with 338 Lapua are slow burners like Retumbo, H1000, and US869. At 250-300 grain bullets, Retumbo seems to be the best one to start with. There are other powders that would be great in the 338 Lapua, like Ramshot Magnum as well as some Vihtavuori powders, but they’re a bit tough to find in my parts. Nothing special needed here. The 338 Lapua Magnum can be reloaded in pretty much any standard press. Below, I have images of the 338 Lapua in a LEE Challenger and LEE Turret Press Classic Cast for comparison. As you can see from the images, they’re both just fine. Full Length Dies/die kits with a full length resizer and bullet seater are available from LEE, RCBS, Redding and Lyman. Neck sizing dies are available from a variety of manufacturers, but regularly priced bushing and collet neck dies are not really available. LEE can make a collet neck die for you, but it’ll be custom based on a 50BMG body and cost will be higher. Redding has a great bushing die, but the price is also pretty high. If you trim cases using the LEE system, you’ll need to order their pilot from the factory as well, but that’s relatively inexpensive. There’s really 1 name in town for the best 338 brass: Lapua. Hornady and Nosler stuff is out there, and you could always use fired Federal or S&B, but you’ll be selling yourself short. The Lapua brass is stronger, more uniform, and will ultimately last longer. If the $300 for 100 cases is too steep for you, try to find a source of once fired military Lapua brass. Do not bother with the other makes of brass.